We’d love your help. Let us know what’s wrong with this preview of Dark Emu by Bruce Pascoe. To ask other readers questions about Dark Emu, please sign up. I’ll say! Pascoe has written often about Aboriginal history, but this is the first book of his I’ve read. He has included extensive references to original diaries and papers as well as to research. There are several photos, but the ones I’ve included here are from other sources. I’ve read some of this information in Bill Gammage's The Biggest Estate on Earth: How Aborigines Made Australia, and I am still gob-smacked that mainstream history hasn’t yet seriously amended its description of the Aboriginal culture of “colonial” times as nomadic and stone-age. To compound the insult, colonists who ran across structures of some kind decided they were evidence of earlier European settlement, which meant they were just “repossessing” what was rightfully theirs. But diaries and reports of the first explorers show clearly that the local indigenous people were well established across the continent. He counts the houses and estimates a population of over one thousand. He’s disappointed that nobody’s home, it’s obvious they have only just left and the evidence is everywhere that they have used the place for a very long time. Just imagine someone moving into your house as Mitchell did during his travels, saying the building was quite comfortable, while you go and hide in the bushes. Unthinkable. There are also well-documented tales of local Aboriginal people stepping in to save injured and starving explorers who think they are charting unknown territory. To be fair, it was unknown . . . to them. But the Aboriginal people across the continent knew the country well and how to look after these lost souls. They also knew each other and traded and shared their songlines, which are a complex system of stories, history, maps, wayfinding, such that there were people from one area who could describe how to find something in an area they’d never visited. I’m not sure many people today could describe such a journey without resorting to technology or at least recording details in writing. The first book I remember reading about Australian history was called something like Cooper’s Creek, about the Dig Tree and the shambles that was the Burke and Wills expedition. With them was Charlie King, who was rescued by the local Aboriginal people and stayed with them long enough to father a child. I’m still not sure what book it was, but it sparked my interest enough to want to migrate, and I did. This book I enjoyed for the information about the harvesting and storage of crops, the wells, the dams, the building - all the hallmarks of a settled civilisation. The people had settled everywhere, even the arid deserts thought to be empty, yet they were dismissed as vermin to be hunted to extinction. Unforgiveable. For a current discussion of the subject, see The Conversation. This isn’t going to go away. This book ought to be made compulsory reading for every Australian. There is a Ted talk by Bruce Pascoe that covers some of the ground covered here (https://www.youtube.com/watch?v=fqgrS...) but this book goes into much more detail. The standard understanding of Australia prior to white settlement, even in the kindest versions, is that the Australian Aboriginals were trapped in a land without domesticable plants or animals. This meant they had to live the nomadic lives of hunter-gatherers, and it This book ought to be made compulsory reading for every Australian. There is a Ted talk by Bruce Pascoe that covers some of the ground covered here (https://www.youtube.com/watch?v=fqgrS...) but this book goes into much more detail. The standard understanding of Australia prior to white settlement, even in the kindest versions, is that the Australian Aboriginals were trapped in a land without domesticable plants or animals. This meant they had to live the nomadic lives of hunter-gatherers, and it also meant they were very unlikely to be able to develop any other forms of technology - they were effectively trapped in the Stone Age. Sure, they had clever sticks they could throw like the boomerang or to help them throw spears further, like a woomera, but really, all this was very prehistoric. They had no agriculture and no permanent settlements, so, when they came into contact with our much more advanced civilisation, really, the outcome was inevitable. Of course, this says something particularly disgusting about western civilisation – that we can’t come into contact with a civilisation less developed than our own without completely destroying it – but then, if the last 1000 years or so have taught us anything about white people, surely it is that. This book provides lots of evidence that the Aboriginal peoples of Australia had much more advanced agriculture and fishing technologies than we have ever given them credit for. That they farmed extensive areas of land, including grains and yams, and that their management of the land proved much more sustainable than anything we have achieved, where they have turned deserts into food bowls, we've done pretty much the exact opposite - as the million or so fish we have just killed over summer in the Darling River shows all too clearly. One of the major arguments of this book is that modern Australia has much to learn from Aboriginal Australia in terms of how to manage our land and waterways. Including the types of crops we should grow. The line I kept thinking of while reading this was from Paul Simon’s The Boxer: ‘All lies and jests, still a man hears what he wants to hear and disregards the rest’. A lot of this book is taken from the journals of explorers who had first contact with Aboriginals. Often the explorers only lived because they raided the grain stores of the Aboriginal people’s whose land they were passing through. Sometimes they would describe Aboriginal women bent over picking yams in cultivated fields that stretched for as far as the eye could see – or came across huts that had clearly been there for years and years. And yet the myth of the hunter-gatherer Aboriginal persisted despite the evidence of their eyes. Of course, this 'confusion' was ‘motivated’. That is, if Aboriginals were hunter-gatherers then they only had a loose connection to the land, certainly nothing like 'ownership'. But if they were farmers, then our dispossession of them might be more difficult to justify. The extensive efforts made by early white settlers to destroy evidence of Aboriginal settlements, farms, houses, and fishing harbours are remarkable and are clearly vandalism on a scale that is hard to comprehend. This book is something else. I feel embarrassed I never knew any of this stuff. We were certainly never taught anything like this at school. It is possible that Australian Aboriginals were among first farmers in the world. This ought to be something Australians more generally should celebrate, but the fact is that we don’t even know it is the case. Honestly, and particularly if you are Australian, you need to read this. Many northern Australian museums display long, knife-like implements, which usually bear legends such as 'of unknown use' when in fact they are juan knives - long sharp blades of stone with fur-covered handles, which the explorer Gregory described the Aboriginal people using to cut down the grain. As one of Australia's most senior archaeologists confided to me after struggling to gain official interest in her excavation of a sophisticated village site in the Murray River region, it is easier for Australian archaeologists to get research grants overseas than for undertaking new areas of research in Australia. [Quoting explorer Charles Sturt:] [I]n walking along one came to a village consisting of nineteen huts... Troughs and stones for grinding seed were lying about... The fact of there being so large a well at this point... assured us that this distant part of the interior... was not without inhabitants. [M]ost of the tool workshops associated with these constructions, as well as the constructions themselves, still do not appear on the archaeological register of Aboriginal Affairs Victoria. King, on the doomed Burke and Wills expedition, found a storage of grain in an Aboriginal house, which he estimated at four tons. [T]he mounds proved to be gigantic ovens for the cooking of the compung rush. Norman Tindale... estimated the milling techniques to be around 18,000 years old, an age which, if it is true, re-writes the history of world agriculture. After studying Aboriginal yields from yam daisies it is easy to imagine a potato farmer turning over part of his farm to yam, thus avoiding the need to use fertiliser and herbicides. Latz says that, 'the nutritional value of the seeds from the desert species is equal to or better than that of the cultivated grains'. Dargin included some wonderful drawings and photographs from the early contact period and these are crucial to our understanding of the hydrology given that more recent photographs show a system compromised by channels for steamboats, levelled areas for regattas, fords and roads. Rupert Gerritsen's important work was similarly bound and, for want of Australian interest, had to be published in London. Both his work and Dargin's are indicative of Australia's nonchalance to important considerations of Aboriginal culture. Some Lake Condah fishery sites were seriously damaged after John Howard, Australian Prime Minister at the time, panicked farmers into believing they'd all be ruined by Native Title claims. The reluctance to credit engineered fisheries to colonised peoples, and thus underrate their sovereignty of the land, is not peculiar to Australia. [I]f they were houses, and if the channels were a fishing system, then around 10,000 people lived a more or less sedentary life in this town. The Victorian Archaeological Survey seemed to be restricted by their own assumptions of Aboriginal development in the same way that so many pokers and prodders of Aboriginal culture seem not to have read the explorers' diaries. If they had, surely they would have gone further than the study of the kangaroo spear and the digging stick in their analysis of Aboriginal economies. ... Sturt's description of the evening whirring of hundreds of mills grinding grain into flour. [W]e have all but ignored ethnographic evidence of Aboriginal engineering. Aboriginals are now seen as poachers simply because the shellfish is so enormously valuable. When it was 'mutton fish' they were allowed to harvest as much as they wanted. Today they are gaoled for pursuing their traditional harvest. The early history of Australia is crowded with references to Aboriginal watercraft and fishing techniques. Yet Australians remain strangely impervious to that knowledge and the Aboriginal economy in general. [T]he observations of the first explorers and settlers provides an enormous body of material. The reason I have provided so many examples, however, is to emphasise the depth of the available material and the desperate need for a revision of our history. Collecting such a welter of evidence might seem a tedious excess to some readers but reference to Aboriginal housing is so remote from the Australian consciousness that, on reading of one or two examples, people might be encouraged to see them as aberrations. Permanent housing was a feature of the Aboriginal economy and marked the movement towards agricultural reliance. Sturt was doing it tough among the savages alright. New house, roast duck and cake! Several villages were located near Birdsville, south-west Queensland, where today the remoteness and inhospitable nature of the land is mythologised as the desolate Outback. Many Australians find it hard to imagine the area as a once productive and healthy environment for large numbers of Aboriginal people. On seeing houses built to accommodate forty people in groups of fifty or more both explorers resort to words like huts or hovels to describe buildings which in rural Ireland would have been called croft houses. People here were not clinging on to survival in the desert; they were thriving and engaged in a rich and joyful life. Mitchell is sensitive to the quality of the houses but insensitive to his occupation of someone else's residence. He occupied empty houses on many occasions and liberties of this kind were likely to have ruptured the relationship between white and black more severely than any action other than physical attack. Gerritsen comments: The suppression, or discouragement of public disclosure of permanent settlements and more sedentary existence may have been yet another factor contributing to a distortion in historical information abut relevant groups and hence modern understandings... The suspicion is that there was intent to discredit evidence of permanent settlements because of the implications this may have had for the morality and legality of the colonial dispossession. On the Darling River, explorers saw similar towns to those seen by Sturt and Mitchell and estimated the population of each to be no less than a thousand. Peter Dargin estimated the population of the region as 3,000 but the journals of Sturt, Mitchell and others reveal that they passed many such populous villages. These figures strongly contradict both current and past assumptions of a sparsely populated pre-colonial land. 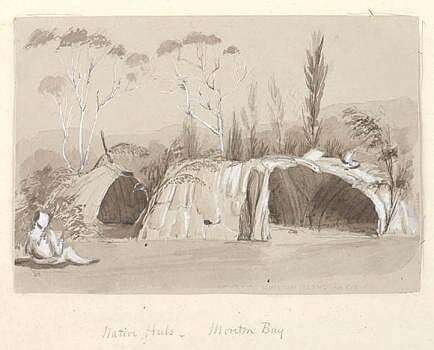 At Mallacoota in 1842 Joseph Lingard met two Aboriginal men and, 'made bold to go into their retreat, which I found to be like a house inside'. [Robinson] reported that the walls and rooves of the beehive, or kraal, type were so substantial that they were strong enough 'for a man on horseback to ride over'. One wonders how that observation was proven and what the owners of the house might have thought of the experiment. The underestimation of Indigenous achievement was a deliberate tactic of British colonialism. Burial within cemeteries is another of the indicators of sedentism recognised by archaeologists and abundant examples are provided in explorers' journals. The importance of examining this material is to dissuade a common Australian perception that Aboriginal and Torres Strait Island people built nothing more complex than a piece of bark leaning on a stick. While we continue to think of Aboriginal people having no construction skills it is easier to dismiss Aboriginal attachment to land. Mitchell hit upon the impediment that inhibits control burns in the Australian landscape today. Farm fences. The only yam plants to be found today are on railway verges and other lands fenced off from livestock and where no superphosphate has been used. Daryl Tonkin, long-term resident of the country near Drouin in West Gippsland, remembers the catastrophic fires of 1939, which he attributed to the increasing reluctance of the Europeans to burn and the habit of leaving the heads of felled trees unburnt. [Edward Curr:] '[T]he blackfellow was constantly setting fire to the grass and trees... he tilled his land and cultivated his pasture with fire'. [G]rassland production has been used as a lure to kangaroos and emus but, primarily, to keep stock away from deliberate plantings of grain and tuber crops. The existence of infrastructure, houses, fences, outbuildings and power lines complicates the adoption of a similar method but does not prevent it. We just have to think differently about the country. The belief that Aboriginal people were 'mere' hunter-gatherers has been used as a political tool to justify dispossession. If we look at the evidence presented to us by the explorers and explain to our children that Aboriginal people did build houses, did build dams, did sow, irrigate and till the land, did alter the course of rivers, did sew their clothes and did construct a system of pan-continental government that generated peace and prosperity, then it is likely we will admire and love our land all the more. [T]he skills employed to bring about the longest lasting pan-continental stability the world has known must be investigated because they might become Australia's greatest export. Of all the systems humans have devised to manage their lives on earth Aboriginal government looks most like the democratic model. Aboriginal people did not 'advance' like Europeans but it is also true the idea to pour boiling oil on enemies seems not to have occurred to anyone in Australia. [Linguist Terry] Crowley admits that Australian languages are probably 40,000 to 60,000 years old, but even at 10,000 years they would be older than most other world languages. Schoolchildren are taught that witchetty grubs were a major food source almost as if there is a deliberate attempt by educationalists to emphasise the gross and primitive. Imagine, instead, re-educating the nation and utilising the two major crops of Australia: yams (as well as other root vegetables) and grains. A 100g sample of Microseris lanceolata tubers would provide 3-4 times the energy level of a 100g potato. Human survival on a healthy planet is not a soft liberal pipe dream; it is sound global management and the deepest of religious impulses. Encouraging full participation of Aboriginal people is not a simple task of handing out fluorescent vests to work in a billionaire's mine but requires a conversation with Aboriginal people about the future of the country. I debated for a long time on whether or not I should properly review this. I didn’t really feel like I could adequately review a book of non-fiction without sounding like a total noob. But at the end of the day, I may be a noob, but this work explores a lot of really important issues about aboriginal culture and land pre-colonisation and I think it’s really important that people are at least aware that this knowledge exists and is publicly available. In saying that however, 1) I haven’t rated it I debated for a long time on whether or not I should properly review this. I didn’t really feel like I could adequately review a book of non-fiction without sounding like a total noob. But at the end of the day, I may be a noob, but this work explores a lot of really important issues about aboriginal culture and land pre-colonisation and I think it’s really important that people are at least aware that this knowledge exists and is publicly available. In saying that however, 1) I haven’t rated it and, 2) it’s going to be fairly short. Both because of aforementioned noob status, but also because I don’t think it’s particularly fair to rate a non-fiction work. Me rating it isn’t exactly going to change the fact that it’s all true. Anyway, I found this book to be a very, very interesting read. It’s amazing how humans can fool themselves into believing their own preconceived notions. Reading this simultaneously amazed and disgusted me just for the fact that people were so arrogant back then. I mean, we still are. Bloody white people think the world was served on a silver platter for them. Ahem. I think that at the end of the day, this book made me reconsider my own bias of indigenous culture, and reflect on what I was taught in school about the colonisation of Australia. Which mainly seems to be that aborigines ‘needed’ the civilised culture westerners forced offered them. In fact, it seems to me that aboriginal people seemed to be doing just fine on their own before we came along. This book proves that there is a need for a more comprehensive coverage of this subject of Aboriginal Australians and their pre colonial agriculture. At 156 pages of text far too short so therefore not as in depth as I would have thought possible. None the less fascinating. Recommended. This should be required reading. And all the money needed to do the further research suggested in this book should be given over now. Read it. In "Dark Emu" the author, Bruce Pascoe, refers to some other books discussing land use in Australia pre-European intrusion. I've read Bill Gammage's "The Biggest Estate on Earth" and thoroughly enjoyed its challenge to read our landscape differently. Bruce Pascoe has Bunurong/Tasmanian Heritage and brings a more overtly political and personal approach to the question of how humans have managed and lived in the Australian country through the millennia. The book isn't long, and I'm not going to try In "Dark Emu" the author, Bruce Pascoe, refers to some other books discussing land use in Australia pre-European intrusion. I've read Bill Gammage's "The Biggest Estate on Earth" and thoroughly enjoyed its challenge to read our landscape differently. The book isn't long, and I'm not going to try to summarise it. It's a challenge to look at the past with new eyes, and so, to see possibilities in the future. Possibilities of native food farming, ecological management, conservation of sacred and archaeological sites, and pride in a sustainable lifestyle heritage. The use of European records to show how they saw the country and the people living in it at first contact is fascinating. There were villages, yam growing (side note: the yam daisy tubers sound delicious), fish processing, so many activities beyond and in addition to what we think of as a hunter-gatherer society -- which is Bruce Pascoe's argument. I learned a lot reading "Dark Emu", from the small stuff to ongoing questions. For instance, I had no idea Australia had it's own red rice, or that it's being studied, and what research like that means. This Christmas I visited a friend who gave me two precious things: a copy of Bruce Pascoe’s book Dark Emu and an envelope of seeds from the daisy yam, Microsceris lanceolata, known as “murnong" in the Boonwurrung language. Dark Emu begins by challenging the received historical wisdom about Australian Aboriginal peoples which says that they were hunter-gatherers who lived opportunistically in a kind of harsh subsistence at the hands of nature. Pascoe argues that this description suited early settl This Christmas I visited a friend who gave me two precious things: a copy of Bruce Pascoe’s book Dark Emu and an envelope of seeds from the daisy yam, Microsceris lanceolata, known as “murnong" in the Boonwurrung language. Dark Emu begins by challenging the received historical wisdom about Australian Aboriginal peoples which says that they were hunter-gatherers who lived opportunistically in a kind of harsh subsistence at the hands of nature. Pascoe argues that this description suited early settlers who wanted to see indigenous people as passive and childlike; unable to take responsibility for the land on which they wandered and undeserving of its possession. By contrast, Pascoe shows a very different indigenous relationship to land and nature. Working systematically through early white accounts of contact with Aboriginal people and their land, Pascoe shows how accomplished Aboriginals were as farmers. The daisy yam is a case in point. This highly nutritious tuber grew prolifically across much of southern Australia and was common in the areas south of Melbourne where I grew up. It is now rare. Within a few short years of white settlement in the mid 19th century, sheep had almost completely wiped it out. It’s easy to take this history at face value and conclude that it was an unfortunate but relatively inconsequential side effect of agricultural development which caused the demise of the daisy yam. What this surface analysis hides is a much more complex understanding of the farming practices of Aboriginal people. When white settlers arrived, they saw an environment which they often described as “park-like”. Early descriptions I have read of the Mornington Peninsula talk about its open grasslands reminiscent of an English park. As a kid on weekend hikes battling my way through the thick scrub of the Otway Ranges, I remember being amazed to recall the stories of an elderly neighbour who had grown up in the area. He talked about the descriptions of the early bushmen who described the area as open and grassed, shaded by the enormous eucalypts that now were just stumps amid a younger generation of regrowth. Pascoe shows that it wasn’t just sheep and logging that changed the environment but a loss of indigenous farming practices. Aboriginal people systematically burned and managed the environment to produce food sources when and where they needed them. The daisy yam requires a loose, friable soil and the harvesting practices supported regrowth and soil conservation in a form of sustainable agriculture which modern Australian farmers are only beginning to understand. Sheep ate the yams, but what was far more destructive was their trampling of the earth which prevented regrowth. Within a few years, parklands were replaced with compacted soils which encouraged erosion and supported far fewer animals - including sheep. Indigenous populations collapsed and their complex management of the land ended. "Some say the idea that the world trajectory is driven by conquest followed by innovation and intensification is satisfying to the Western mind because of our psychological dependence on our imperialist history. But if we give consideration to the idea that change can be generated by the spirit and through that to political action, then the stability of Australian Aboriginal and Torres Strait Islander culture might be more readily explained. (p.136)"
In the later part of the book, Pascoe explores visions and versions of what it means to live well. Against the history of Western imperialism, Pascoe contrasts at least 40,000 years of carefully evolved environmental understandings deeply embedded in the cultural practices of Indigenous Australians. As the world looks forward to a more sustainable future through aspirations like the United Nations Sustainable Development Goals, Dark Emu is a timely contribution to alternative views of history and a reminder that much of the knowledge we need may already exist. A rather important, worthwhile read for all Australians. "Dark Emu" is one of several recent books (another being the comprehensive "The Greatest Estate on Earth") seeking to shatter the many misconceptions about the way Aboriginal Australians lived before their land was taken over by the white man. "Arguing over whether the Aboriginal economy was a hunter-gatherer system or one of burgeoning agriculture is not the central issue. The crucial point is that we have never discussed it as a nation. T A rather important, worthwhile read for all Australians. "Dark Emu" is one of several recent books (another being the comprehensive "The Greatest Estate on Earth") seeking to shatter the many misconceptions about the way Aboriginal Australians lived before their land was taken over by the white man. "Arguing over whether the Aboriginal economy was a hunter-gatherer system or one of burgeoning agriculture is not the central issue. The crucial point is that we have never discussed it as a nation. The belief that Aboriginal people were 'mere' hunter gatherers has been used as a political tool to justify disposession." An amazing journey, well-written and researched. This beautifully researched survey of Australian indigenous agriculture is jam-packed with fascinating information about some very sophisticated land management, infrastructure-building and primary production practices. Pascoe's innovative approach combines archaeological evidence from contemporary fieldwork with meticulously researched archival accounts of the earliest white colonisers, whose observations of the local peoples they encountered reveal much more now than they did to 18th- and 19th This beautifully researched survey of Australian indigenous agriculture is jam-packed with fascinating information about some very sophisticated land management, infrastructure-building and primary production practices. Pascoe's innovative approach combines archaeological evidence from contemporary fieldwork with meticulously researched archival accounts of the earliest white colonisers, whose observations of the local peoples they encountered reveal much more now than they did to 18th- and 19th-century white society. The book is divided into sections that cover particular themes or ideas – land boundaries, housing, fisheries, religious practices, animal husbandry, and so on. it's striking and innovative to be making the claims Pascoe does for indigenous cultures: that they were just as recognisable as 'civilisations' as the European cultures of the same or earlier periods, and in many ways were more advanced. It's exciting to think how we can advance and broaden our contemporary use of land by tapping these ancient knowledges of how to enrich and harvest them. And it's shameful to see how white colonists have stupidly dismantled successful land use practices just because they failed to recognise their significance. This is a brilliant summary of the evidence that Indigenous Australians had much more developed societies than we were taught about in school. Farming, aquaculture, stone houses and more - all described by early colonial explorers, but lost in the broader narrative of terra nullius. The writing's pretty dry, but this is an important and necessary piece of work, with major implications for Australia today. In this book, Bruce Pascoe argues that the common perception of Indigenous Australians leading a ‘hunter-gatherer’ lifestyle before European settlement ignores strong evidence of sophisticated farming and agriculture practices. While there was a lot of movement by Indigenous Australians, there was also more sedentary living, involving the construction of buildings. He mentions explorers who saw building large enough to contain 30 to 40 people. Mr Pascoe has drawn on work by Bill Gammage, Rupert Gerritsen and others as well as his own research to support his argument. I found this book absolutely fascinating, and reading it has made me keen to look at some of the work Mr Pascoe has drawn on. The common perception that Mr Pascoe refers to is exactly what I was taught at school fifty or so years ago. There was no discussion of any alternatives. ‘But when next the Aboriginal Elders brought their young men to the initiation site they found it full of bullet-riddled beer cans. That last sentence is a sad indictment and, as much as I’d like to believe differently, I doubt that this is an isolated incident. In fewer than two hundred pages, Mr Pascoe presents a far broader picture of Indigenous Australian land use. 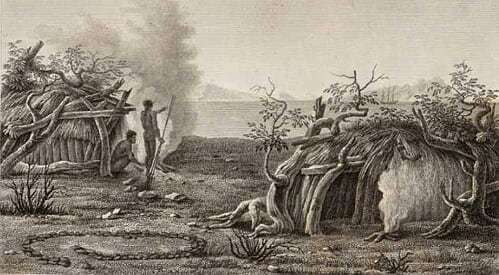 A picture which is largely drawn from early explorers’ accounts as they moved across Australia. If, like me, you were taught that Indigenous Australians were only hunter gatherers, you may wish to read this book and consider the possibilities. As Mr Pascoe writes, much of what Indigenous Australians learnt over thousands of years has value to us today. It was painful as well as enlightening to read this book. Painful because my ancestors who invaded this land so brutally over-ran the indigenous inhabitants. Enlightening because I learnt so much about aboriginal management of the land as well as culture and spirituality. It's technically an academic text, I guess, but very accessible for the layperson. In the final chapter the author suggests ways we can heal from past events and reconcile. It's do-able too. Fascinating and essential reading for all Australians. Incredibly eye-opening. I wish every Australian would read this book. I've been living in Australia for about 6 years now, maybe more - by now I learned that you can predict how white Australians feel about their indigenous population based on their political spectrum. Someone on the 'right' will say that Indigenous Australians were lucky that the British colonisers arrived, they weren't using the land and without the British they would have lived in the dirt forever. Someone on the 'left' will say that Indigenous Australians were peaceful children of the earth, l I've been living in Australia for about 6 years now, maybe more - by now I learned that you can predict how white Australians feel about their indigenous population based on their political spectrum. Someone on the 'right' will say that Indigenous Australians were lucky that the British colonisers arrived, they weren't using the land and without the British they would have lived in the dirt forever. Someone on the 'left' will say that Indigenous Australians were peaceful children of the earth, living in harmony off the land, taking what was needed and not changing anything. Of course, I exaggerate, but the 'right' story above is close to what's being taught in schools here. What Pascoe is trying to do here is to reevaluate all the evidence there is on pre-white Indigenous society. He looks at explorers' notes and diaries, shows how their preconceptions and their racism made indigenous buildings, installations, traps etc. 'invisible' to them - for example, food storage buildings were interpreted to be natural formations. From there it followed that Australia was terra nullius, an empty unused country with a bunch of hunter/gatherers running around. Terra nullius was overturned in 1992, and the concept itself is still widely accepted (again, see above). That 'hunter/gatherer' tag is what Pascoe is trying to overturn using this book, and for that he looks at numerous aspects of Indigenous Australian history. There's farming, aquaculture (fish traps), housing/architecture, storage, fire, spirituality, and law, and from there, how Australia's future could be shaped in light of this knowledge. I work in plant breeding and this has given me dozens of ideas for future research - it will be so interesting to look for patterns of artificial selection in the yam daisy (Microsceris lanceolata), for example - did Indigenous Australians have a breeding program, can we find evidence of that in the genome? Australian food culture is a strange thing, imported Western European food, not much local food (bar the occasional kangaroo sausage or steak). It is hard to farm Western staple crops in Australia, but that is still what the large majority of farmers are doing (see BBC a few days ago). Australian native plants are seen not as a source of nourishment, but as an occasional source of novelty. So much to change! I think this is one of the most important books to come out of Australia, and if you're at all interested in this country then you should go and read it. The tone isn't dark in anyway, but taken together, it makes for a depressing read - so much knowledge has been lost. If we can reform our view of how Aboriginal people were managing the national economy prior to colonisation, it could lead us to reform the ways we currently use resources and care for the land. Imagine turning our focus to the exploitation of meat-producing animals indigenous to the country. Imagine freeing ourselves from the overuse of superphosphates, herbicides and drenches, freeing ourselves from the need of fences and instead experimenting with grazing indigenous animals and growing indigenous crops. It seems improbable that a country can continue to hide from the actuality of its history in order to validate the fact that having said sorry we refuse to say thanks. Should we ever decide to say thanks, the next step on a moral nation’s agenda is to ensure that every Australian acknowledges the history and insists that, as we are all Australians, we should have the opportunity to share the education, health and employment of that country on equal terms. Many will say that equality is insufficient to account for the loss of the land but in our current predicament it is not a bad place to start. Every Australian should read this, or at least become familiar with the material. Dark Emu is a first rate extended essay. It presents the heretofore unknown history of Australian Aboriginal agriculture, economy and ways of life, and describes the way European immigrants and hero-worshipped explorers ignored the clear signs (and some that were apparently too subtle) of civilisation and of the manipulation and interaction with the landscape. Pascoe writes about the native crops that were cultivat Every Australian should read this, or at least become familiar with the material. Dark Emu is a first rate extended essay. It presents the heretofore unknown history of Australian Aboriginal agriculture, economy and ways of life, and describes the way European immigrants and hero-worshipped explorers ignored the clear signs (and some that were apparently too subtle) of civilisation and of the manipulation and interaction with the landscape. Pascoe writes about the native crops that were cultivated and the ways they were managed, and suggests ways of bringing back the farming methods that sustained Aboriginal people for millennia - that seem to work on this dry continent with its particular soil. The style is - well, I've described it as an essay - documentary and somewhat academic. Pascoe writes with real conviction, making his own position clear and encouraging the reader to take the same position and also to feel curious to learn more about Aboriginal ways of life. One thing that I found strange in reading Dark Emu was the insistence against the perception that Aboriginal Australians were 'mere' hunter-gatherers: rather, they did build towns and work the land. That's fine, but what's so bad about hunting and gathering? Pascoe seems to argue that it's seen as primitive, whereas farming is seen as a sign of a more developed way of life. I'd thought that hunting and gathering was supposed to be kinder to the land, whereas farming was harder on it - but Pascoe reckons it's just that Western farming methods and crops/stock aren't designed for Australian conditions. Either way, I imagine Pascoe's dispute with the 'hunter-gatherer' label must be partly because it's not accurate and partly because the stereotype worked against Aboriginal people when it came to Native Title - maybe the white guys were arguing that 'they're not farming the land, they're just wandering around and taking from it' to deny Aboriginal entitlement to the land. Excellent writing, not only for Australians. As a literature review of early writings of Australian explorers, this is selective and feels bitty. And some of the jumps to conclusions don't seem to be supported by the evidence provided (reminds me of my Philosphy 101 class - A=B, B=C, A=C - not always!). The strenuous arguments provided for why historic labels about aboriginal culture and practices are invalid or inaccurate seem rather pointless - by all means change them but doing so doesn't change history. But all the same I really enjoyed As a literature review of early writings of Australian explorers, this is selective and feels bitty. And some of the jumps to conclusions don't seem to be supported by the evidence provided (reminds me of my Philosphy 101 class - A=B, B=C, A=C - not always!). The strenuous arguments provided for why historic labels about aboriginal culture and practices are invalid or inaccurate seem rather pointless - by all means change them but doing so doesn't change history. I had a wonderful day reading Dark Emu: Black seeds: agriculture of accident? by Bruce Pascoe. Engagingly written, full of interesting material and a modest 176 pages , it was the ideal end-of-conference read. Pascoe draws on the work of Bill Gammage, R Gerritsen and others as well as his own research to make a strong argument for the reconsideration of our understanding of the way Aboriginal people lived in colonial times. He draws extensively from the journals of explorers to present a remarkab I had a wonderful day reading Dark Emu: Black seeds: agriculture of accident? by Bruce Pascoe. Engagingly written, full of interesting material and a modest 176 pages , it was the ideal end-of-conference read. Pascoe draws on the work of Bill Gammage, R Gerritsen and others as well as his own research to make a strong argument for the reconsideration of our understanding of the way Aboriginal people lived in colonial times. He draws extensively from the journals of explorers to present a remarkable array of evidence about the agricultural and technological sophistication of Aborigines before contact. Pascoe demonstrates that the journals of the explorers are fascinating if you cut through the euro-centric paradigm under which they were recording their observations. Pascoe interrogates the journals and is able to glean some gems. Every Australian should read 'Dark Emu, Black Seeds: agriculture or accident'. At the very least, it should be on the compulsory reading list for all secondary schools. It overturns all of our ignorant assumptions about pre-colonial times in Australia. I was privileged to hear the author, Dr Bruce Pascoe, speak at the Melbourne Writers' Festival a few months ago. His emotion was obvious when he referred to archaeologists discovering grindstones proving that the Australian aborigine was grinding Every Australian should read 'Dark Emu, Black Seeds: agriculture or accident'. At the very least, it should be on the compulsory reading list for all secondary schools. It overturns all of our ignorant assumptions about pre-colonial times in Australia. As Pascoe spoke, I wondered whether our community’s entrenched views of Aborigines could be blamed on the first European settlement being beside Sydney Harbour, a heavily-wooded area on thin soils. It was not farming country, as the incoming settlers soon discovered. With sandstone caves providing a natural shelter for the indigenous population there was little need for housing structures. Many of the First Fleet journal keepers referred to the nakedness of the natives, but we forget that the incoming Europeans arrived at the height of summer, a time of year when many of today’s citizens of Sydney would wear no clothes, if they could get away with it. The first but false impression that the Aborigines were hunter-gatherers took firm hold. After his talk I spoke to Bruce Pascoe briefly. He’s from Victoria but well aware that Captain John Hunter reported in 1788 that ‘the people around Sydney were dependent on their yam gardens’. The word ‘garden’ is telling, its significant implication of permanent settlement having been ignored. Yams, a highly-nutritious form of sweet potato, were cultivated by a resident tribe, not gathered by wandering tribes. And, as Pascoe pointed out, the cattle imported in 1788 had escaped to the Camden region, where they prospered on these yam gardens until 1795, when exploring parties came across them, in prime condition. The area was promptly named as the Cowpastures. After 1788 it took decades before European explorers found a way across the Blue Mountains and discovered that Aborigines lived in villages and towns and, aside from their yam gardens, they cared for a grain belt across most of inland Australia, the extent of it illustrated on an amazing map. Now that I’ve read Bruce Pascoe’s book I fully accept the startling truths he espouses. The full range of his evidence is presented in chapters headed 'Agriculture', 'Aquaculture', 'Population and Housing', 'Storage and Preservation', 'Fire', 'The Heavens, Language and the Law' and 'Australian Agricultural Revolution'. But it was his closing chapter, 'Accepting History and Creating the Future', which really made me think. I’m sometimes irritated by the strident calls that we should change the day we celebrate as Australia Day because it was ‘Invasion Day’. From my perspective, Australia was always going to be invaded by someone. While the Aboriginal tribes had their own territorial boundaries they were not organised as a group to defend this large continent, whereas all other human societies fought strongly to protect territorial interests. Aborigines just weren't aggressive enough. It never occurred to me until I read 'Dark Emu' that the age-old Aboriginal society might have evolved to a level of enlightened self-interest, mutual co-operation and steady-state economic welfare operating on a higher plane than existed elsewhere on this planet. In a way, the Aborigines were psychologically unprepared for people who did not play by their advanced rules. The old ways of Aboriginal society tantalise us with a vision for a different more sustainable future for the world. Thus one of Pascoe’s closing remarks resonated with me: ‘It seems improbable that a country can continue to hide from the actuality of its history in order to validate that fact that having said sorry we refuse to say thanks’. I would hope that an indigenous Australian read this book would experience a lot of punching the air and YEAH! and "that's what grandma/uncle/cousin always said!" moments. I fear, though, that instead there would be a lot of anger ('why weren't we told? '), bewilderment (ditto), dismay (ditto, and 'where is it now?') and sheer sadness for what's been lost - physically, and as knowledge - and for what's been taken away. People like me - not indi Every non-indigenous Australian should read this book. People like me - not indigenous, benefiting from ancestors who colonised this land, taking it away from the original owners - should be humbled to learn what was here for tens of thousands of years, which we then screwed up, and denied knowledge of. Dark Emu is Bruce Pascoe's exploration of the evidence that Aboriganal Australians had far more agricultural experience, knowledge, and activity than tends to be acknowledged in the standard Australian story. The general line is that when the British arrived, they found nomadic inhabitants who followed game and picked fruit from trees. More recently, you might hear people talk about Aboriginals using fire to move game or set up places where game would come for easy hunting. Pascoe shows that the agricultural acitivites of Aboriginal Australians went far, far beyond that. As as historian, I really liked the way Pascoe built the evidence for his argument here. One of the things that's often said about it being hard for writing pre-British invasion history is that the original folk left so few records, and because modern white historians privilege writing. Pascoe does multiple things to that. Firstly, he discusses the archaeological record, which is there if you accept what you're looking at. Secondly, he shows that there is writing to be used: it's the journals and letters of white explorers, who simultaneously recorded what they saw indigenous Australians doing and denigrated them. And thirdly, he makes some excellent points about how modern writers categorise societies and civilisation. My favourite bit is in talking about the use of pottery. Just because ancient Greek, Roman, and Chinese civilisations used pottery doens't make pottery a marker of civilisation... it makes pottery a marker of those civilisations, of a particular way of doing society. And Pascoe quotes Bill Gammage in drawing a distinction between farming, and being a farmer: "one is an activity, the other a lifestyle" (14). Brilliant. I also want to mention how much I appreciated and enjoyed Pascoe's style. This is not a dry historical account, with the author attempting or pretending to absent himself from the discussion. Instead, Pascoe is very much present - commenting on where sections have been updated with further information from various sources, pointing out how Australian farmers could benefit from the knowledge of how Australian Aboriginals did things, occasionally making snarky comments about the explorers' notes. It's a very honest history, since no author is truly objective and aloof from their topic. "Pascoe draws on the work of Bill Gammage, R Gerritsen and others as well as his own research make a strong argument for the reconsideration of our understanding of the way Aboriginal I first became aware of this remarkable book when two of my favourite bloggers posted reviews of it on the same day: they are both historians, and they were both impressed. "Pascoe draws on the work of Bill Gammage, R Gerritsen and others as well as his own research make a strong argument for the reconsideration of our understanding of the way Aboriginal people lived in colonial times. He draws extensively from the journals of explorers to present a remarkable array of evidence about the agricultural and technological sophistication of Aborigines before contact." 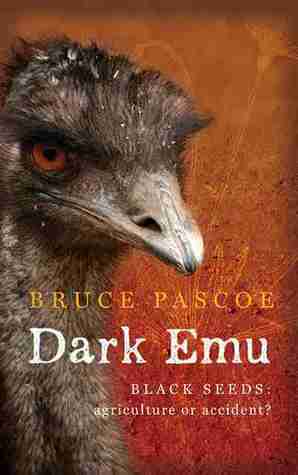 "Bruce Pascoe’s book Dark Emu argues directly against the idea that Australia was ‘scarcely settled’. It was, he argues, very much settled in a way that forces us to reconsider the ‘hunter-gatherer’ label that is often used to describe pre-colonial Aboriginal Australians." If I could give this book 1000 stars I would. As someone about to become an Australian who refuses to pledge allegiance to a British queen and who acknowledges the disaster that it was not to become independent at the beginning of the century therefore taking us trough two murderous world wars...I am dumbfounded to find that Australians (in general) choose the Anzac spirit as the main national identity symbol. People know very little about Aboriginal culture (and the little they know is tainted b If I could give this book 1000 stars I would. People know very little about Aboriginal culture (and the little they know is tainted by white supremacy and colonial racism that is very much alive today) and Bruce Pascoe has done the nation a great service by bringing out to the light the evidence that is pretty much out in the open but that our colonized minds choose not to see. I want everyone to read this book. It enlarged my understanding of the culture and lifestyles of Aboriginal people at the time of early European settlement and exploration, particularly the agricultural and fishing practices. Early records are revealing of so much descriptive material that did not see the light when I was at school and in tertiary education. The picture of thinly spread wandering nomads needs to go. I was startled at how populated certain areas of Australia were, with substantia I want everyone to read this book. It enlarged my understanding of the culture and lifestyles of Aboriginal people at the time of early European settlement and exploration, particularly the agricultural and fishing practices. Early records are revealing of so much descriptive material that did not see the light when I was at school and in tertiary education. The picture of thinly spread wandering nomads needs to go. I was startled at how populated certain areas of Australia were, with substantial villages, of several thousand people, and how organized the food production was. Heard Pascoe speaking on RN radio and what he said was riveting. The book, however, is not. The content is very interesting, and debunks many of the myths about the original owners of this land (Australia). But it's written in a very academic style...almost as if it is a dissertation. That was a disappointment after hearing what an engaging speaker Pascoe can be. Still, I'm glad I followed up the radio program. Must read! There is much to learn and apply from our Aboriginal and Torres Strait cultures, if only we take the time to invest in it. Bruce Pascoe was born of Bunurong and Tasmanian Aboriginal heritage in the Melbourne suburb of Richmond and graduated from the University of Melbourne with a Bachelor of Education. He is a member of the Wathaurong Aboriginal Co-operative of southern Victoria and has been the director of the Australian Studies Project for the Commonwealth Schools Commission. Bruce has had a varied career as a teach Bruce Pascoe was born of Bunurong and Tasmanian Aboriginal heritage in the Melbourne suburb of Richmond and graduated from the University of Melbourne with a Bachelor of Education. He is a member of the Wathaurong Aboriginal Co-operative of southern Victoria and has been the director of the Australian Studies Project for the Commonwealth Schools Commission. Bruce has had a varied career as a teacher, farmer, fisherman, barman, fencing contractor, lecturer, Aboriginal language researcher, archaeological site worker and editor. He won the Fellowship of Australian Writers´ Literature Award in 1999 and his novel Fog a Dox (published by Magabala Books in 2012), won the Young Adult category of the 2013 Prime Minister's Literary Awards.